Legends abound here, historically and fictionally alike, but they all pale in comparison to the beauty of the Adirondack Mountains and the cities and towns that have made a home in this naturally diverse wonderland of mountains, lakes and forests. The Adirondack DestinationTM Bracelet is a tribute in precious metals to the majestic and storied terrain, which offers even the occasional visitor a quiet and rejuvenating respite. Blanketed in forest and crowned by peaks and domes, the Adirondacks are captured in design. 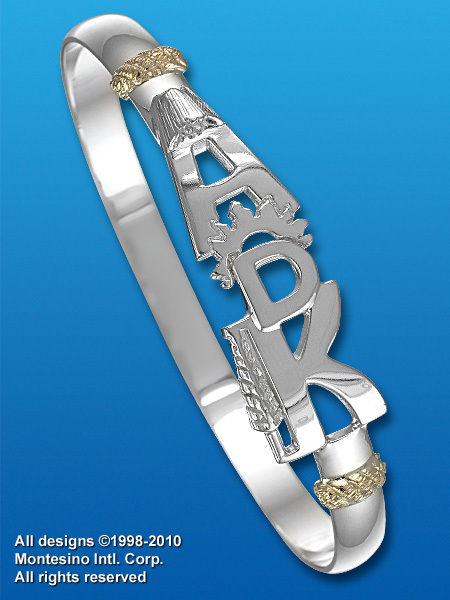 The Adirondack DestinationTM Bracelet is wrought with symbols of natural beauty and features two 14 karat wraps signifying the St. Lawrence River and Lake Champlain, between which, The Adirondacks have flourished for millennia. For a day... a week... or a lifetime of weeks, The Adirondack Mountains beckon, and The Adirondack DestinationTM Bracelet pays homage to this awe inspiring corner of the world.